The ODNI’s map highlights the Islamic State’s and al Qaeda’s global footprint, though the jihadists are not a major force in some of the countries depicted. The ODNI’s map recognizes the presence of Al Qaeda’s senior leadership (AQSL) in Iran. The Office of Director of National Intelligence (ODNI) released its annual “Worldwide Threat Assessment” today. The written statement accompanied oral testimony given by Director Daniel Coats to the Senate Select Committee on Intelligence. The ODNI warns that both the Islamic State and al Qaeda maintain global networks that are far from defeated. The Islamic State still has “thousands” of fighters in Iraq and Syria alone, contradicting claims by President Trump and other administration officials that the so-called caliphate has been defeated. The map above is the ODNI’s assessment of the areas where the Islamic State, al Qaeda and affiliated groups operate. The Islamic State and al Qaeda remain bitter rivals, often clashing in some of the areas shown. However, both have a significant global footprint. Despite years of counterterrorism pressure, al Qaeda’s senior leadership remains active and in command of a widespread network. 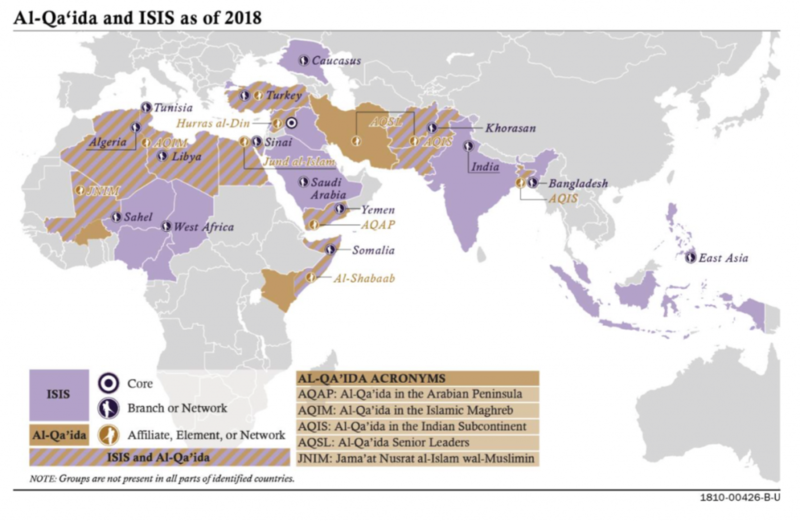 Al Qaeda’s senior leaders (AQSL) are “strengthening the network’s global command structure and continuing to encourage attacks against the West, including the United States,” the ODNI states. The ODNI’s report also highlights the significant role played by al Qaeda’s regional branches or “affiliates.” Each affiliate is overseen by an emir who has sworn his personal bayat (or oath of loyalty) to Ayman al-Zawahiri. The affiliates listed in the ODNI’s report are: Al Qaeda in the Arabian Peninsula (AQAP), Al Qaeda in the Islamic Maghreb (AQIM), Al Qaeda in the Indian Subcontinent (AQIS), Jama’at Nusrat al-Islam wal-Muslimin (JNIM) and Shabaab in Somalia. Other al Qaeda-linked groups listed on the map include Hurras al-Din (the “Guardians of the Religion” Organization) in Syria and Jund al-Islam in the Sinai. “All al-Qa’ida affiliates are involved in insurgencies and maintain safe havens, resources, and the intent to strike local and regional US interests in Africa, the Middle East, and South Asia,” the ODNI states. However, the ODNI does not explain why each of these al Qaeda affiliates is waging an insurgency. They are attempting to overthrow existing governments or power structures and replace them with Islamic emirates, or states, based on al Qaeda’s version of sharia. For al Qaeda, this is a long-term project, fraught with difficulties and setbacks, but it is the organization’s goal nonetheless. AQAP has twice seized much of southern Yemen, only to retreat under pressure from a coalition of forces. AQIM and JNIM’s predecessor groups conquered much of Mali before a French-led intervention forced the jihadists to release their grip on territory. AQIS is dedicated to helping the Taliban resurrect its Islamic Emirate of Afghanistan — a goal that is closer today than at any point since late 2001. The ODNI’s report notes that the al Qaeda “network’s affiliate in South Asia,” meaning AQIS, “provides support to the Taliban.” In Somalia, Shabaab holds much ground and is attempting to take even more territory from the international-backed government. The ODNI’s map points to Hurras al-Din in Syria, but doesn’t list Hay’at Tahrir al-Sham (HTS). Until July 2016, Al Nusrah Front was al Qaeda’s official “affiliate,” or branch, in Syria. Al Nusrah’s primary goal was to topple Bashar al-Assad’s regime and eventually replace it with an Islamic emirate. Al Nusrah Front was rebranded twice and has operated as HTS, an ostensibly independent organization that has disassociated itself from al Qaeda, since Jan. 2017. Hurras al-Din was formed by former Al Nusrah officials in early 2018, after a leadership dispute erupted in the jihadis’ ranks. While the ODNI doesn’t list HTS as an al Qaeda “affiliate,” the State Department still considers the group to be one, as does the UN. ODNI states that al Qaeda “elements in Syria…continue to undermine efforts to resolve that conflict,” without naming the specific parties. Hurras al-Din is in the al Qaeda fold, but FDD’s Long War Journalassesses it is likely that other groups in Syria are as well. The true picture is murky for a number of reasons, including the repeated organizational reshuffling and serious disagreements among the jihadis about basic matters. Al Qaeda’s other affiliates remain strong in several areas around the globe. Al Qaeda “affiliates in East and North Africa, the Sahel, and Yemen remain the largest and most capable terrorist groups in their regions,” the ODNI reports. “All have maintained a high pace of operations during the past year, despite setbacks in Yemen, and some have expanded their areas of influence.” The “setbacks” in Yemen include both a high-value target campaign led by the US and a multi-sided war. The latter has meant that AQAP’s commanders and fighters are embroiled in a day-to-day conflict against various adversaries, including the Iranian-backed Houthis. It should be noted that al Qaeda’s network has not successfully struck a target in the West since Jan. 2015, when a pair of brothers, facilitated by AQAP, conducted a targeted attack on Charlie Hebdo’soffices in Paris. The network’s affiliates are largely focused on matters inside the regions in which they operate, though it is always possible that al Qaeda will attempt a more significant plot in the West once again. The ODNI’s Worldwide Threat Assessment contains a clear warning about the Islamic State’s ability to regroup, should the US and its partners give the self-declared caliphate the space. The Islamic State “still commands thousands of fighters in Iraq and Syria, and it maintains eight branches, more than a dozen networks, and thousands of dispersed supporters around the world, despite significant leadership and territorial losses,” the ODNI warns. The Islamic State maintains a global network of “provinces,” which are headed by officials loyal to Baghdadi. Some of these “provinces” have poached from existing al Qaeda groups, though with limited success. In the Sinai and Southeast Asia, Baghdadi’s enterprise wooed significant cadres of jihadists to its cause. After a series of leadership losses weakened al Qaeda’s presence in the Caucasus, the Islamic State won the loyalty of important commanders. In Somalia and Yemen, the Islamic State’s attempted expansion was met with stiff resistance from al Qaeda’s affiliates, but the group has established a foothold. Maps such as the one produced by the ODNI are a useful tool for envisioning the extent of the jihadists’ operations, but they have limits. For example, the entirety of India and Saudi Arabia are colored in with a light purple that is intended to signify the Islamic State’s presence. Of course, the group doesn’t control either country and its operations appear to be much smaller in scale than the coloring would suggest. The same is true for Iran, where al Qaeda’s leaders operate and the group maintains a facilitation network. But al Qaeda doesn’t control territory inside Iran. Both groups have facilitation networks inside Turkey, as depicted on the map, but it is difficult to assess the overall strength of these operations as compared to other countries. Indeed, the map could mislead the reader into thinking that all countries are equally important to the jihadis when this is clearly not the case. In some countries the jihadis have large-scale guerrilla armies, while in others they have less substantial terror or facilitation networks. For instance, both Iraq and India are colored purple to recognize the Islamic State’s presence. But whereas Iraq has been central to the Islamic State’s so-called caliphate, India has been far less significant, with the jihadis establishing only a limited terrorist presence thus far. Similarly, all of Egypt is colored in to represent the presence of both the Islamic State and al Qaeda, but the jihadists are currently conducting only sporadic attacks inside the mainland. And most of these are attributed to the Islamic State’s local arm. There are other problems like this as well. Still, the ODNI’s map is useful for conveying the fact that both the Islamic State and al Qaeda are operating in multiple countries today. And in some of the countries depicted, the jihad rages very hot. *Obviously, it is likely that the US gave the UN much of the information cited in its report on al Qaeda and the Islamic State, so the similarity in language and conclusions shouldn’t be surprising.